Beautifully engraved scarce certificate from Napster, Inc.. This historic document was printed by the American Banknote Company and has an ornate border around it with a vignette of the Napster logo. This item has the signatures of the Company’s President and Secretary. Napster Inc.'s business is downloading music. The firm operates an online music service that allows users to download audio files to PCs and portable music players. Some 700,000 subscribers to Napster, which is compatible with MP3 players and mobile devices such as Apple's iPhone and iPod. Service plans can access the company's music library of some 10 million songs licensed from major record companies and independent labels. Napster also offers audio files for individual download. The service is available in the US, Canada, the UK, and Germany. Napster is a subsidiary of retail giant Best Buy. 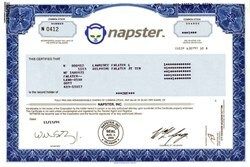 In 2011 Rhapsody announced plans to acquire Napster from Best Buy. Napster is a name given to two music-focused online services. It was originally founded as a pioneering peer-to-peer file sharing Internet service that emphasized sharing audio files, typically music, encoded in MP3 format. The original company ran into legal difficulties over copyright infringement, ceased operations and was eventually acquired by Roxio. 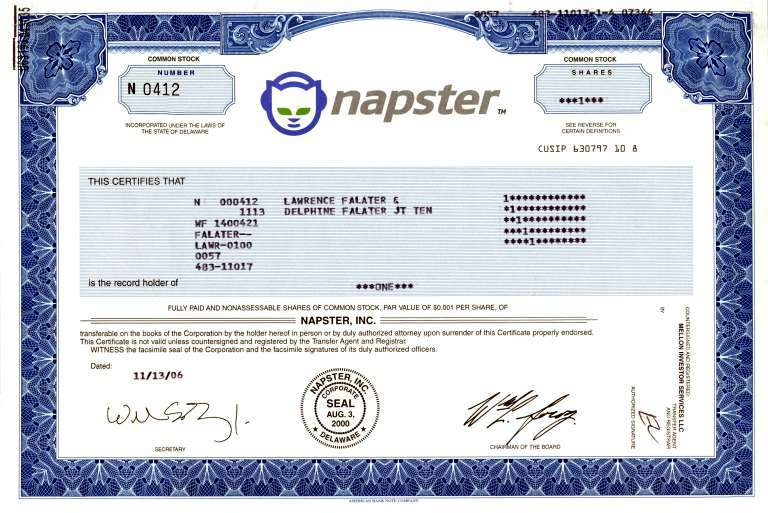 In its second incarnation Napster became an online music store until it was acquired by Rhapsody from Best Buy on 1 December 2011. Later companies and projects successfully followed its P2P filesharing example such as Gnutella, Freenet and many others. Some services, like Grokster, Madster and the original eDonkey network, were brought down or changed due to similar circumstances. Napster was co-founded by Shawn Fanning, John Fanning, and Sean Parker. Initially, Napster was envisioned as an independent peer-to-peer file sharing service. The service operated between June 1999 and July 2001. Its technology allowed people to easily share their MP3 files with other participants. Although the original service was shut down by court order, the Napster brand survived after the company's assets were liquidated and purchased by other companies through bankruptcy proceedings. Although there were already networks that facilitated the distribution of files across the Internet, such as IRC, Hotline, and USENET, Napster specialized in MP3 files of music and a user-friendly interface. At its peak the Napster service had about 80 million registered users. Napster made it relatively easy for music enthusiasts to download copies of songs that were otherwise difficult to obtain, like older songs, unreleased recordings, and songs from concert bootleg recordings. Some users felt justified in downloading digital copies of recordings they had already purchased in other formats, like LP and cassette tape, before the compact disc emerged as the dominant format for music recordings. These reasons aside, many other users simply enjoyed trading and downloading music for free. They created a username and password and were able to make their own compilation albums on recordable CDs, without paying any royalties to the artist/composer or the estate of the artist/composer. High-speed networks in college dormitories became overloaded, with as much as 61% of external network traffic consisting of MP3 file transfers. Many colleges blocked its use for this reason, even before concerns about liability for facilitating copyright violations on campus. Napster running on Mac OS 9 (using Kaleidoscope theme utility) in March 2001. The service and software program were initially Windows-only, but in 2000 Black Hole Media wrote a Macintosh client called Macster. Macster was later bought by Napster and designated the official Mac Napster client ("Napster for the Mac"), at which point the Macster name was discontinued. Even before the acquisition of Macster, the Macintosh community had a variety of independently developed Napster clients. Most notable was the open source client called MacStar, released by Squirrel Software in early 2000 and Rapster, released by Overcaster Family in Brazil. The release of MacStar's source code paved the way for third-party Napster clients across all computing platforms, which gave users advertisement-free music distribution options. Heavy metal band Metallica discovered that a demo of their song "I Disappear" had been circulating across the network even before it was released. This eventually led to the song being played on several radio stations across the United States and brought to Metallica’s attention that their entire back catalogue of studio material was also available. The band responded in 2000 by filing a lawsuit against Napster. A month later, rapper and producer Dr. Dre, who shared a litigator and legal firm with Metallica, filed a similar lawsuit after Napster would not remove his works from their service, even after he issued a written request. Separately, both Metallica and Dr. Dre later delivered thousands of usernames to Napster who they believed were pirating their songs. One year later, Napster settled both suits, but this came after being shut down by the Ninth Circuit Court of Appeals in a separate lawsuit from several major record labels (see below). Also in 2000, Madonna's single "Music" leaked out on to the web and Napster prior to its commercial release, causing widespread media coverage. Verified Napster use peaked with 26.4 million users worldwide in February 2001. 1.That its users were directly infringing the plaintiffs' copyrights. 2.That Napster was liable for contributory infringement of the plaintiffs' copyrights. 3.That Napster was liable for vicarious infringement of the plaintiffs' copyrights. Napster lost the case in the District Court and appealed to the U.S. Court of Appeals for the Ninth Circuit. Although the Ninth Circuit found that Napster was capable of commercially significant non-infringing uses, it affirmed the District Court's decision. On remand, the District Court ordered Napster to monitor the activities of its network and to block access to infringing material when notified of that material's location. Napster was unable to do this and shut down its service in July 2001. Napster finally declared itself bankrupt in 2002 and sold its assets. It had already been offline since the previous year owing to the effect of the court rulings. Along with the accusations that Napster was hurting the sales of the record industry, there were those who felt just the opposite, that file trading on Napster actually stimulated, rather than hurt, sales. Some evidence may have come in July 2000 when tracks from English rock band Radiohead's album Kid A found their way to Napster three months before the CD's release. Unlike Madonna, Dr. Dre or Metallica, Radiohead had never hit the top 20 in the US. Furthermore, Kid A was an experimental album without any singles, and received relatively little radio airplay. By the time of the record's release, the album was estimated to have been downloaded for free by millions of people worldwide, and in October 2000 Kid A captured the number one spot on the Billboard 200 sales chart in its debut week. According to Richard Menta of MP3 Newswire, the effect of Napster in this instance was isolated from other elements that could be credited for driving sales, and the album's unexpected success suggested that Napster was a good promotional tool for music. One of the most successful bands to owe its success to Napster was Dispatch. Being an independent band, it had no formal promotion or radio play, yet it was able to tour to cities they had never played and sell out concerts, thanks to the spread of their music on Napster. In July 2007, the band became the first independent band to ever headline New York City's Madison Square Garden, selling it out for three consecutive nights. The band members were avid supporters of Napster, promoting it at their shows, playing a Napster show around the time of the Congressional hearings, and attending the hearings themselves. Shawn Fanning, the founder of Napster, is a known Dispatch fan. Since 2000, many musical artists, particularly those not signed to major labels and without access to traditional mass media outlets such as radio and television, have said that Napster and successive Internet file-sharing networks have helped get their music heard, spread word of mouth, and may have improved their sales in the long term. One such musician to publicly defend Napster as a promotional tool for independent artists was Dj xealot, who became directly involved in the 2000 A&M Records Lawsuit. Chuck D from Public Enemy also came out and publicly supported Napster. Although some underground musicians and independent labels have expressed support for Napster and the p2p model it popularized, others have criticized the unregulated and extra-legal nature of these networks, and some seek to implement models of Internet promotion in which they can control the distribution of their own music, such as providing free tracks for download or streaming from their official websites, or co-operating with pay services such as Insound, Rhapsody and Apple's iTunes Store. Napster's facilitation of transfer of copyrighted material raised the ire of the Recording Industry Association of America (RIAA), which almost immediately—on December 7, 1999—filed a lawsuit against the popular service. The service would only get bigger as the trial, meant to shut down Napster, also gave it a great deal of publicity. Soon millions of users, many of them college students, flocked to it. After a failed appeal to the Ninth Circuit Court, an injunction was issued on March 5, 2001 ordering Napster to prevent the trading of copyrighted music on its network. Lessig claimed, however, that this decision made little sense from the perspective of copyright protection: "When Napster told the district court that it had developed a technology to block the transfer of 99.4 percent of identified infringing material, the district court told council for Napster 99.4 percent was not good enough. Napster had to push the infringements 'down to zero.' If 99.4 percent is not good enough", Lessig concluded, "then this is a war on file-sharing technologies, not a war on copyright infringement." In July 2001, Napster shut down its entire network in order to comply with the injunction. On September 24, 2001, the case was partially settled. Napster agreed to pay music creators and copyright owners a $26 million settlement for past, unauthorized uses of music, as well as an advance against future licensing royalties of $10 million. In order to pay those fees, Napster attempted to convert their free service to a subscription system. Thus traffic to Napster was reduced. A prototype solution was tested in the spring of 2002: the Napster 3.0 Alpha, using the ".nap" secure file format from PlayMedia Systems and audio fingerprinting technology licensed from Relatable. Napster 3.0 was, according to many former Napster employees, ready to deploy, but it had significant trouble obtaining licenses to distribute major-label music. On May 17, 2002, Napster announced that its assets would be acquired by German media firm Bertelsmann for $85 million. Pursuant to terms of that agreement, on June 3 Napster filed for Chapter 11 protection under United States bankruptcy laws. On September 3, 2002, an American bankruptcy judge blocked the sale to Bertelsmann and forced Napster to liquidate its assets according to Chapter 7 of the U.S. bankruptcy laws. After a US$2.43 million takeover offer by the Private Media Group, an adult entertainment company, Napster's brand and logos were acquired at bankruptcy auction by Roxio which used them to rebrand the Pressplay music service as Napster 2.0. In September 2008, Napster was purchased by US electronics retailer Best Buy for US $121 million. On December 1, 2011, pursuant to a deal with Best Buy, Napster merged with Rhapsody. Best Buy received a minority stake in Rhapsody.